HOUSTON – Eagle’s Trace, a retirement community in Houston’s Energy Corridor, opened a new $24.5 million building. Dubbed Amarillo Terrace, the new building spans 180,000 sf and has added 108 new independent living units to the community, bringing Eagle Trace’s total independent living units up to 571. The building is the fifth living center on the 71-acre campus and is connected to the rest of the community by climate-controlled walkways and outdoor paths. Amarillo Terrace offers one-, two- and three-bedroom units that all have at least 1.5 bathrooms. The building will include 17 new floorplans that come with stainless steel appliances, granite countertops and screened-in balconies with a view of the community’s lake. ​Monthly fees at the community range between $2,900 and $3,500 with entrance deposits starting at $153,000. Units in the new building range from 900 sf to more that 1,800 sf. 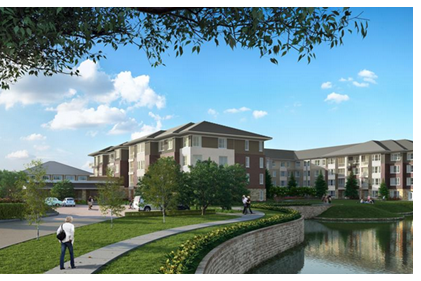 Amarillo Terrace is already 79 percent leased, according to Pam Burgeson, sales director at Eagle’s Trace. About 70 families are expected to move into the building by the end of the year.